Robin's Eccentricities: Affording the little extras. I am a devoted homemaker but I want to feel that I am making some form of financial contribution to our household to supplement our income. These are ways to do that regardless of your own circumstances. Disabled, retired, SAHM or working outside the home.With each item listed below, just click the name to go to the site if you are interested. They will all open in a new window. The nice thing with all of these options is if I don't want to bother with them I don't have to. I can work when I want to to kill spare time or not do anything to spend time with my husband when he is home. For many of these I sit down in the afternoon after all the housework is done and spend a couple hours working on them. I thought I would share with you some of the ways that I earn an extra $400-600 a month. It's not all at once, the money comes in sporadically but it always comes in handy. Some of it is in the form of Amazon gift cards. I love that though because I ship so much overseas from Amazon. Once you spend $25 the shipping is free so it saves me a great deal in shipping charges! It also gives me a chance to buy cool kitchen stuff that I want or need without using my husbands income. Or you can save it all up and not have to spend a dime out of pocket to buy Christmas or birthday gifts. 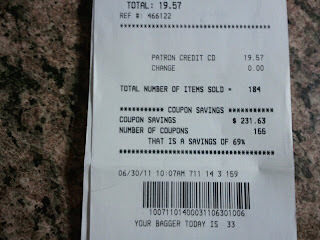 One of my favorite ways to 'earn' extra income is to use coupons. 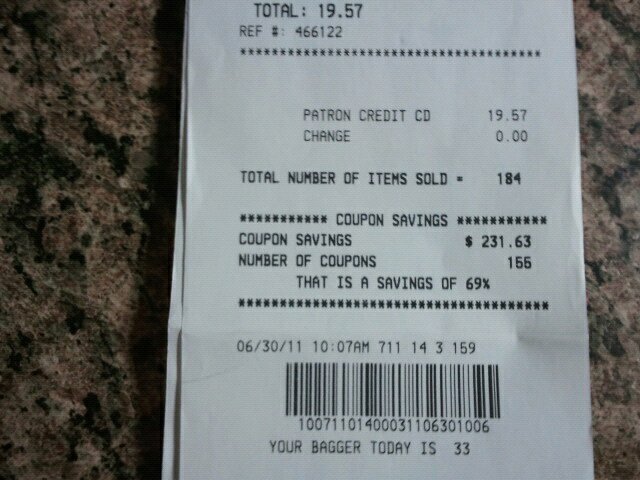 I save 50-80% on shopping therefor doubling or more any money spent. I spend approximately 10 hours a week looking at sales and matching them, clipping coupons and organizing my trips. It is a part time job and if you want to do it you have to be serious. I would be glad to help if I can, but it's too much for this post. If you are interested enough I could do a series on how I do it. But I won't unless there is some interest. There are tons of blogs and sites out there that offer help too. **Regarding internet printed coupons** Use MyPoints or SwagBucks to print your coupons. You get 10 points from each for every one that you use! ** That will really increase earning potential. 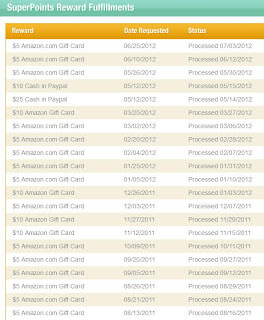 My VERY favorite way to earn money is Superpoints. It is similar to the others. You just click a 'lucky button' and get points. It is by invitation only so you have to click the link to join. Same thing, cash, gift cards, etc. This one is great! It's like playing a slot machine but you don't have to pay anything they pay you! The trick to this one is to fill out your basic profile completely. It gives you extra spins. If you get a Refer A Friend bonus, post it to Facebook. If two friends sign up you get more spins AND you also win any points they spin! Here is a screen shot of some of my rewards. The one I have done the longest, long before the Army, is MyPoints. They send you an email, you click the link and get 5 points. You can do that alone or if you are going to buy something online click through their website and really rack up points. 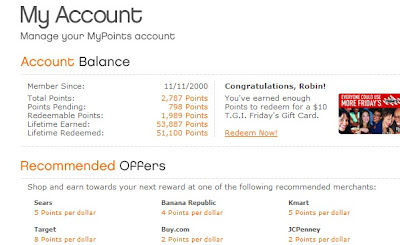 I consistently get gift cards for wherever I want from MyPoints and highly recommend it. Fill out your profile (you will find these when you click on trusted surveys under where it says 'welcome back.' They are worth 5SB each. Have a birthday. That is super easy to do right? When you do you get 50SB. 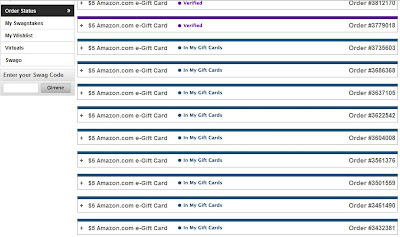 If you want to try a survey you might get lucky occasionally and get a bunch of swagbucks. You will have better luck getting these once all your profiles are filled out. They have many options on how to cash out your points. I choose Amazon because it seems to be the best value for the points required. Getting cash to Paypal requires more points. For me chances are I'm going to spend on Amazon anyway. This is a new one to me. In one month though I earned enough to cash out and 5% goes to a charity of my choice (Red Cross) and Crowdtap matches my donation. They also have opportunities to get free products from places like Old Navy. You have to fit a specific demographic and I have so far been too old. Go figure. :) You do 'Quick Hits' to level up to get better offers and earn more. This is another survey site. Ugh! I hate taking surveys. This one is a little different. There is no minimum cash out! HOORAY! I wait until I get the emails, three of them that offer $.01 just for trying. I know that doesn't seem like much but it's better than any of the other survey sites that give you nothing. There are lots of different ways to earn too. Check it out. You still won't get rich but a little extra money is always nice. 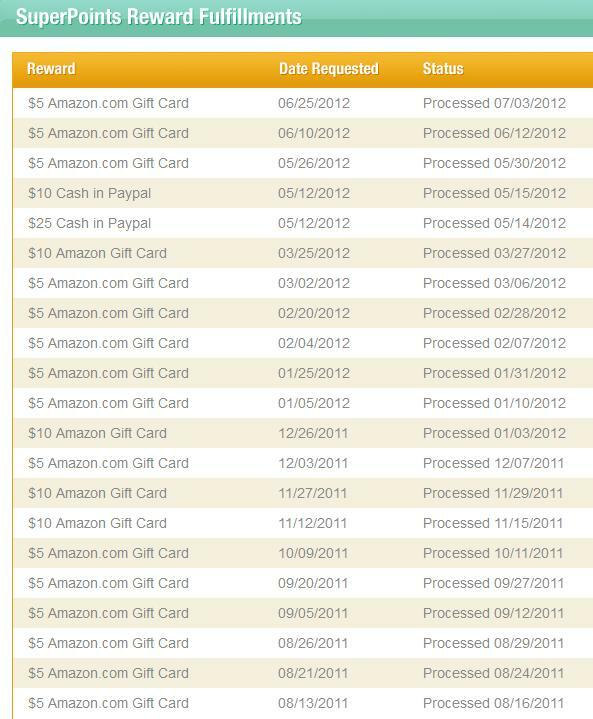 I have cashed out several times in just three months with almost $100 total. This is a survey site. You get points for just trying to qualify for a survey which makes it more worth my time. I hate trying to qualify for surveys and get nothing. I have made $50 from this one in just a short time. They also do product testing. There it is. I don't make a fortune, far from it. But what I make in small amounts usually covers household shopping expenses. I also do not go shopping more than once a week, my goal is only once every two weeks. That is a long day because I visit all the stores in one day. Very tired by the end of it! As always, if you have any comments or questions let me know. I'll gladly answer them.